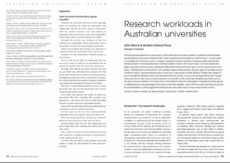 This article provides insight into the nature of research workload allocation for Australian academics. It explores the distinction between research performance and research workload allocation. Research performance can be judged at an institutional level, a work group level or an individual level. The process by which an institution’s research performance is judged is not necessarily suitable at the level of the individual academic. The research performance of individual academics is based on their ‘research output’, in the form of publications, grants or supervision of research students, but historically, little attention has been paid to the ‘input’ or the time required to achieve these outputs. To determine the real costs of research, and to examine academic working conditions, this paper argues the clear distinction must be made that ‘output’ is about research performance; whereas ‘input’ is about research workload allocation. Therefore, what is needed is a suite of reasonable time allocations which can be associated with research activities, as is the case for teaching related activities. The paper analyses data from an online survey, circulated to academics across Australia in 2016, in which staff estimated the typical time spent on a wide range of research related tasks. The findings from the 2059 respondents show staff strongly support a transparent and holistic approach to workload planning which acknowledges the full range of activities they undertake. Analysis of the times associated with the research tasks led to the development of a table of suggested time estimates, based on the median values, for many common research activities.